In front of two vocal student sections that lacked a filter, Paulding County (12-1) put their nearly pristine record on the line against cross town Region 7-AAAAA rival East Paulding (6-5), who is already two wins away from their most victories in a season since 2012-13 under new Head Coach JW Cantrell. Even with the clear size, skill and athletic advantage it wasn’t until the four-minute mark of the fourth quarter that the Patriots were finally able to put away an upset-minded Raider group. The Patriots entered Wednesday night without one of the state’s top scorers, Jervon Morris (24.9 ppg) who was suspended for disciplinary reasons. Even without Morris, Paulding County played their trademark up-tempo style and pressed the full length of the court. East Paulding traded buckets with Paulding County as Azer Tidor, a 20+ point-per-game scorer got to the rack early for six points in the opening frame. Tidor never got into a clean flow however as the Paulding County press harassed East Paulding and picked up eight of their 30 steals in the first quarter to set the tone while John Cook capitalized on the other end, the athletic 6-foot-5 forward scoring nine points to give the Patriots a 22-19 lead after one. Missing star post Sean Rutledge, Coach Cantrell turned to Cole Brown who provided a spark in the second quarter scoring and rebounding the ball, but Paulding County continued to stretch the lead, going on a 10-4 run to make it 32-23 at the 4:32 mark, Cook scoring eight points during the stretch. With the Patriots having the ability to bury opponents in a flash, the Raiders responded with a 7-0 run of their own, Silas Johnson Jr. knocking down a three and Ravon Melon finishing two And-1s, but missing both free throw attempts to make it 32-30 with 3:03 left in the first half. As East Paulding tried to make a game of it, Paulding County punched back with their defensive pressure suffocating the Raiders. Keon Sedgwick capped a 7-2 run which pushed the lead out to 39-32. At the half Paulding County led 44-39 playing at a Patriot pace. 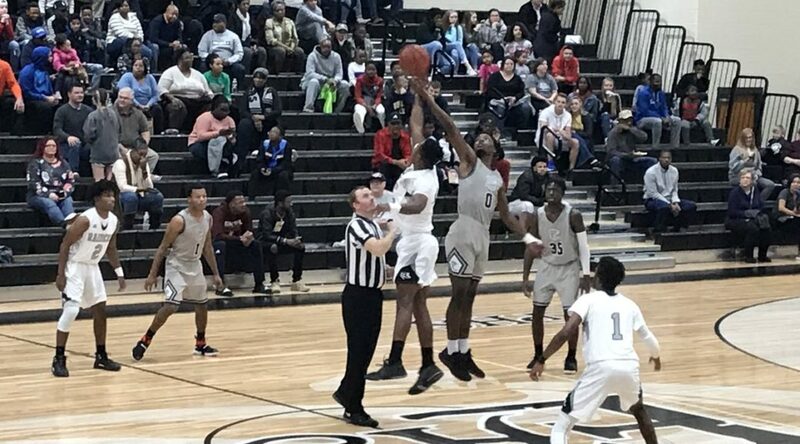 By the break, Cook had already dumped in 20 points and the free throw advantage for the aggressive Patriots started to balloon, going 11-of-20 from the line while East Paulding shot 1-of-6, both teams leaving crucial points at the line. The Patriots popped East Paulding right out of the gate in the third, swarming for easy steals – Sedgwick, Corleone Thomas and Jamal McIver at the forefront of the pressure which made the score 50-41 after two Sedgwick pull-ups. But once again, East Paulding wouldn’t lay down, cutting the lead back to three before a Thomas layup in traffic made it 52-47 at the 4:48 mark. It’s been non-stop action. Neither coach has called timeout. Every time it looks like the Raiders will break, they come back. The Raiders cut the lead to 58-54 but in the blink of an eye, a Trell Evans three and a McIver steal and layup grew the Patriot advantage to 63-54 with 1:13 remaining before settling with a 67-56 lead heading into the fourth quarter after closing the third on a 9-2 run, Evans netting 11 points in the period. With East Paulding seemingly on the ropes, the Raiders struck a 9-1 run to trim the score to 68-65 at the 6:20 mark following a Johnson three and put-back. The three-point deficit would be as close as the Raiders would get as Cook unleashed an onslaught in the final six minutes after failing to score in the third. The senior piled in 12 of his game-high 32 points in the deciding quarter as the Patriots ripped off a 13-2 run to put the game out of reach, making it 81-67 with 3:10 left to play. In the fourth quarter the Patriots went 7-of-19 from the line, taking more attempts than the Raiders did the entire game going 9-for-18. Paulding County finished 20-of-42 from the line but the story was East Paulding’s inability to handle the press and Cook’s knockout fourth that closed the game 90-77 in favor of the visitors. Paulding County was impressive with their overall length, athleticism and aggressiveness. They are the type of team that will overwhelm bad teams and feast on weaker competition which they have done so this year. They may run into trouble when they play disciplined teams with good guard play or teams that can control the tempo and play in the half court. Their lone loss came against Carrollton who had the competency to handle ball pressure and elected to run with them, winning 92-76. Either way, the Patriots are an exciting group to watch and they should be able to secure another state tournament berth and have a ton of natural talent. The details surrounding the suspension of Jervon Morris aren’t pretty if true, but if and when he’s allowed back on the court, it gives Coach Kevin Hammitt another potent scorer. John Cook was great for the Patriots tonight. After three years of chasing stability, he has found it and showed the type of talent he has finishing with 32 points (5 threes), 7 rebounds and 5 steals. He could be a good fit at the JUCO level. Sparkplug Trell Evans stepped up in a big way with his speed and tenacity. His third quarter helped Paulding County extend its lead with Cook going scoreless. The length of Corleone Thomas and Keon Sedgwick led to 13 combined steals. Sedgwick played the role of swiss army knife, collecting 9 points, 5 rebounds, 4 assists, 7 steals and 2 blocks. He’s a wiry and lively player, always getting involved in plays. He had lightning quick hands that led to easy poke aways and showed a nice pull-up jumper. The fact that East Paulding was able to hang around until the four-minute mark was quite impressive. Outmanned, the Raiders had to scrap all throughout the night and punished the Patriots on the glass, outrebounding the bigger and more athletic visitors 58 to 32. The Raiders were horrendous against the press and all but neutralized their large rebounding advantage however. A lack of a true point guard was apparent as the Patriots bullied them with their pressure leading to 30 Paulding County steals. 6-foot-2 senior Azer Tidor had a quiet 20 points, 16 rebounds, 3 assists, 1 steal and 1 block if that’s even possible. Tidor was steady throughout, scoring six points in the first, third and fourth quarters. The 6-foot-2 combo guard is a nice sleeper prospect that doesn’t play AAU. He’s got a good feel for the game and didn’t get too flustered with the aggressive Patriot defense. He liked to pull-up from the elbow but also showed the ability to finish at the basket. He could help out a small college looking for a reliable option on the wing. Silas Johnson Jr., a 6-foot-3 senior, hit three three-pointers en route to 15 points and 8 rebounds. The lefty isn’t much of a ball handler, but he’s long and can help stretch the floor and rebound. The Raiders will be adding one of the best players in the region this January as 6-foot-5 junior post Sean Rutledge will be eligible. He is a game-changing presence with his ability to score with his back to the basket and will give Coach JW Cantrell a very talented inside-out duo with Tidor on the perimeter. East Paulding’s best basketball is on the horizon as they look to shatter last year’s 8-win mark.